It's probably because I didn't read the original series, but I couldn't really get into this short story. While, of course, all characters were new to me and I had some trouble understanding the magic in this world, and that's completely my own mistake, I also felt the story was lacking something. There may be more to Erica's first love than she at first believes. I wanted to like it, I really did. But there was too much exposition for my liking right from the beginning. Perhaps it would have made more sense had I read the other series as well and perhaps it fits there better, I don't know. Some of the characters seemed to have interesting backstories though that were not explored in this short novel. It might also just be me, but I was a little bit disappointed by it and had expected more from it. 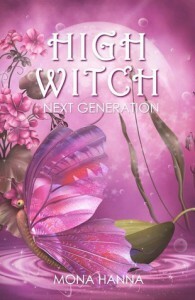 High Witch Next Generation is the first novella in the Generations series which is a spin-off series of the High Witch series. I won a copy of this book in a Booklikes giveaway!